The first filmatization of Frank Herbert`s DUNE novel was universally hated when released over 30 years ago. Even those who actually read the brick of a book, had a hard time to understand what the heck was going on in Lynch`s incomprehensible dark universe. "Several of the characters in DUNE are psychic, which puts them in the unique position of being able to understand what goes on in the movie." 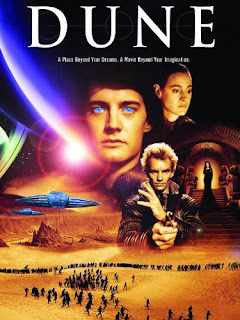 Personally I think that DUNE is one of the most misunderstood movies: Turning the complex universe from Herbert`s novel into a movie is near impossible without taking some freedoms with the content or universe. And Lynch`s dark, twisted vision is actually giving a pretty good feel of what a feudal, low-tech society would be like some 20.000 years from now. Since the early seventies the concept of DUNE as film was already burning money as it went from directors like Ridley Scott over Alejandro Jodorowsky (who has not read the book and did not intended to do so...he probably would have made a bigger mess than Lynch) and finally to Lynch. "So, there is this feudal, spacefaring society in the far future where computers are outlawed..."
"No, not like Star Wars AT ALL: No blasters, no x-wings and no droids"
"But a lot of knife fights, everybody is on a mind expanding drug which also prolongs life and.."
"Yeah, that drug is part of the reproduction cycle of some kilometer long worms on a desert planet and is actually the basis of that societies economy. A 15 year old aristocrat gets addicted and gets so high that everybody thinks he is the messiah!" If you haven`t watched DUNE, try to watch the 3 hour long extended version. It is out on youtube somewhere.